However, the actual SEO bit of SEO (the optimisation of your website to search engines) can be a bit tricky in the default installation of everybody’s favourite Content Management System – WordPress. Luckily WordPress has a range of plugins to make your life easier. Yoast is pretty much the king of WordPress Plugins. 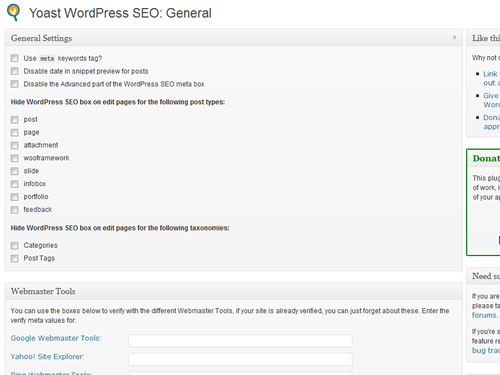 If you’re not familiar with his plugins, then you’re not really familiar with WordPress. King of his plugins is his “WordPress SEO”. This should be the first plugin you install, as not only can you control any site’s Title and Meta Tags, but it can also create a sitemap for you, allow breadcrumbs on your site (which help internal linking and structure), and – most importantly if you’re a serial site creator (which – after reading How I Ranked Page 1 In Google For Under $50 – you should be), settings can be imported and exported easily. Although Yoast’s WordPress SEO does a lot of internal linking quickly and easily via the breadcrumbs, helping your site strucutre, you can also use Blogmechanics KeywordLink to help interlink your post. 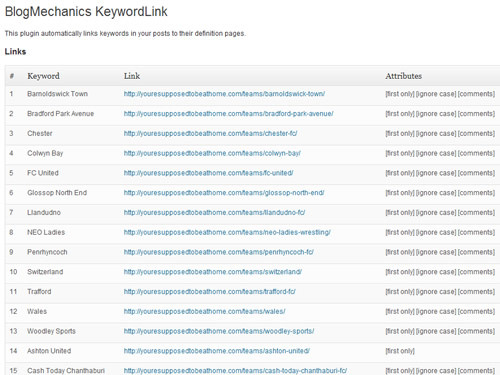 When you type in a pre-defined keyword it is automatically linked to another page. You can specify when and how often you should use this (I will talk about this in a later post), but soon your bland blog will be covered in links to your other importent pages. Internal linking is the forgotten red-headed stepchild of SEO, use it. This was only discovered recently, but I love it. Use Google Libraries does exactly what it’s named. 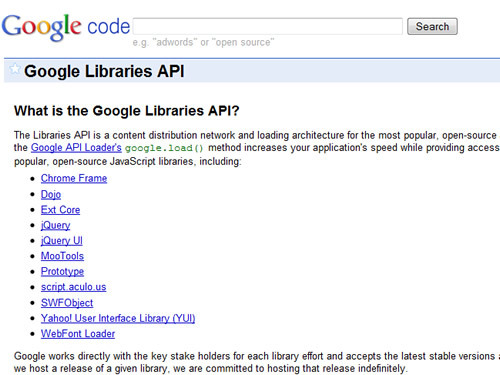 For common Java libraries (such as Sifr and jQuery), Google hosts the .js libraries. This plugin allows you to use those libraries as opposed to those hosted on your own server. Google’s servers are more reliable and faster than yours will ever be, so this is a good thing. Furthermore, page speed is seen to be a ranking factor in search engines, so by using Google Libraries, you’re reducing your bandwith (saving you money) and speeding up your site. This can only be a good thing. Use it. Again, another plugin to improve page speed. WP Smush.it optimises the loading speed of probably the the largest items on most people’s blog – images. Smush.it is a lossless image reduction tool. What this means is that a lot of the image data is removed, yet the quality of the image doesn’t drop. WP Smush.it allows you to use Smush.it from any image you upload. Ironically, even though that improving page speed can lead to higher positions in the search engines, it can result in your images not being indexed as well in Google Images. In all honesty, unless you’ve created an infographic or an image that can be shared to add value to your blog, then I wouldn’t worry too much about it. 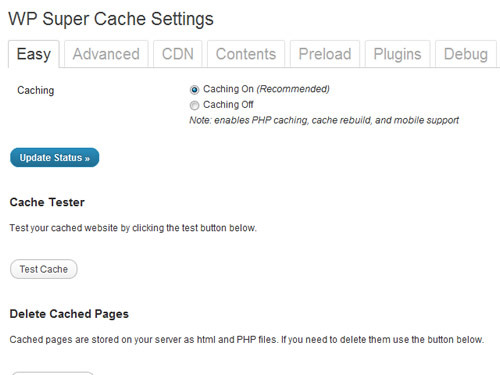 Once your blog gets a little bit of traction and traffic, then a caching plugin is a must. The top plugin in it’s field is W3 Total Cache, which is a beast of a plugin that uses clever server-side technology to reduce the server load. However, a number of the services use Cloud Hosting and Content Delivery Networks. If the last sentance has you scratching your head and say “You what?”, install WP Super Cache. I’ve used it on my sites, and you upload it, activate it, and then switch it on from within the WP Super Cache options screen. It’s simple, quick and fun. These are my 5 favourites. None of these above are essential to rank in search engines, however using any of these will make it a hell of a lot easier. What are your favourite plugins?